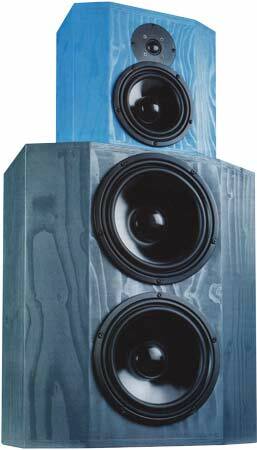 DD (standing for dynamic duo) is a 3 way floorstanding loudspeaker with closed bassrange system that employs two woofers Visaton W250 S, 8 Ohm. On top is a satellit cabinet with tweeter Visaton G 25 FFL and mid-woofer Visaton W 170S. DD has been developed by Holger Barske and Thomas Schmidt. The crossover consists of a 3rd order high-pass filter (18 dB per octave slope) for the tweeter, a bandpass filter (12 dB high - and 12 dB lowpass) for the mid-woofer. The two woofers are connected to a 2nd order low-pass filter. Between 80 Hz and 20000 Hz, the frequency response of this loudspeaker is linear on axis, with a loudness sounding. The decay spectrum is nearly perfect except a resonance at 1200 Hz. At low volume, i.e. 85 dB at 1 m, the nonlinear distortions are lower than 1% above 200 Hz and below 2% at 95 dB at 1 m .
mid-woofer Visaton W170 S, 4 Ohm. The high-end kit comes with ClarityCap PX capacitors for the tweeter. The important inductances are baked varnish air core coil for minimizing microphonic effects. - The current flow through the coil creates a magnetic field which sets the reel of wire in motion. This motion induces a voltage in the coil which adds itself to the signal. The stiffer the reel of wire is, the less the signal will be altered.